The tavern called "At the seven Swabians" is hereby opening its hospitality towards you. Sit down at the table and let us refresh you with bier, vine or mead as well as feed you with dishes that bid abundance of taste and smell. Let the landlord fill your mugs over and over again and be charmed by both music and lovely maids - we are having the year 1493! For those of you, that want to truly immerse yourselves in the medieval atmosphere, there is nothing like a real banquet in the restaurant. Every Friday and Saturday evening from 8.00 pm, you can experience a feast with a dozen select courses with as much beer and wine as you can drink and a medieval programme. 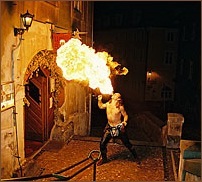 You will meet fire-spitters, fire-eaters as well as attractive medieval and gipsy dancers undulating their bodies to the music. For only 1000 CZK pro person, you will get for unforgettable hours in Middle Ages all inclusive. Reservation necessary!